WARNING!! SPOILER ALERT: If you have not seen The Walking Dead season five finale and do not want to know what happens, do not read any further. The season five finale of The Walking Dead aired on Sunday, Mar. 29. 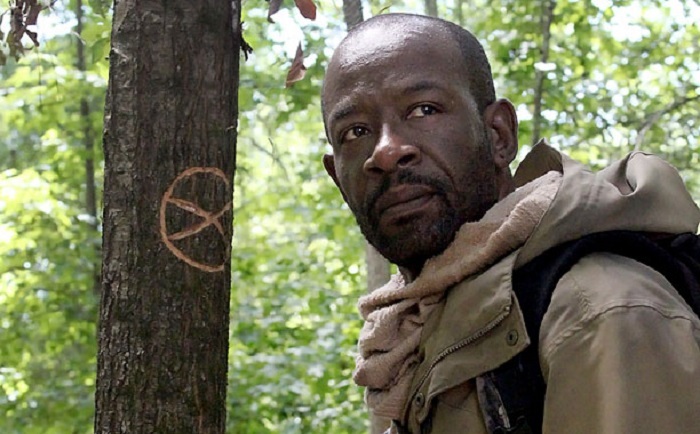 Several of our questions were answered with this episode, like what had happened to Morgan (Lennie James) after Rick (Andrew Lincoln) met up with him the second time, and who were some of the people involved with the walkers the had a ‘w’ cut into their foreheads. Morgan in the season finale of The Walking Dead. At the beginning of the episode, we see Morgan sleeping inside of a car somewhere out in the woods. While he is heating up something in a cup at a campfire sometime after, he is confronted by a man with a familiar ‘w’ on his forehead. This man, holding a gun to Morgan, explains that the ‘w’ on his head means wolves, which is the group of scavengers that he belongs to. After a friend of the man tries to sneak up and stab Morgan, Morgan quickly knocks both men out and locks them in the car that he was sleeping in. Back in Alexandria, Rick has woken back up and explains to the other members of his group about the stolen guns. It is announced that Deanna (Tovah Feldshuh) is going to have a meeting over possibly exiling Rick. Skipping ahead some, Daryl (Norman Reedus) and Aaron (Ross Marquand) are tracking a man in a pancho when they come across a canning factory only mildly overrun. When they open up the trucks, a trap triggers and hundreds of walkers pour out of the vehicles, forcing the two into a car in the courtyard. Just as they were about to attempt a suicidal escape, Morgan comes and frees them. Morgan asks for directions to somewhere and hands Daryl a map with Rick’s name on it. Back in Alexandria, a broken Father Gabriel leaves the main gate open and lets in some walkers while Deanna is holding the big meeting. Rick quickly goes and dispatches all of the walkers, bringing one back to the meeting to show that walkers can get in on their own. Pete (Corey Brill) then shows up with Michonne’s (Danai Gurira) katana, threatening to kill Rick. Pete then accidentally slits Deanna’s husband’s (Steve Coulter) throat. After Deanna’s approval, Rick shoots either Deanna’s husband or Pete, which isn’t shown. Cue a shocked Morgan looking at Rick after he shot whoever. The final scene shows the two men who attacked Morgan at the beginning next to a car that has painted on it “WOLVES NOT FAR”. 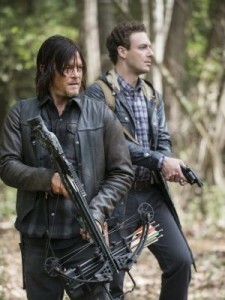 Daryl and Aaron looking for survivors. So this episode did answer the questions mentioned above, but really just left us with even more questions than we started with. We don’t know who Rick shot in the final moments of the episode or how Morgan will react to that. We also barely know anything about the Wolves, only that they are not a friendly group of people and will kill without reason. For those who have read the comic version of The Walking Dead, the Wolves could be the replacement of the group of people who tried to take Alexandria by force. We also don’t know how the mental states of Father Gabriel or Sasha (Sonequa Martin-Green) will be later on, whether or not they will keep going crazy or if they will get it together and stop trying to either fail at suicide by walker or go on a mass hunt to try and kill every single walker. This finale was arguably the best one the show has seen yet. It left me hanging on the edge of my seat by the end and really wanting to know the answers to all of the unknowns that they left off with. We will all just have to wait until October of 2015 when season six starts to find out. Hello I'm Frank Garcia and I am the creator of the Frankly Speaking videos and stories. I am an assistant editor on staff and plan to be the multimedia editor in my senior year in place of Kayla Gunn. My goal is to keep all the students at Mac up to date on some of the things going on in the gaming/ entertainment world.